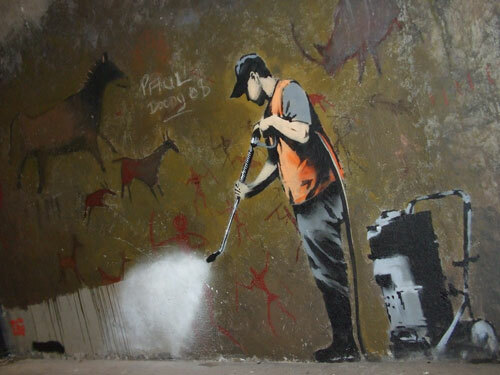 On my recent trip to London, I was strolling in an outdoor market with friends when one of them pulled us into a stall featuring the work of her favorite artist, Banksy. 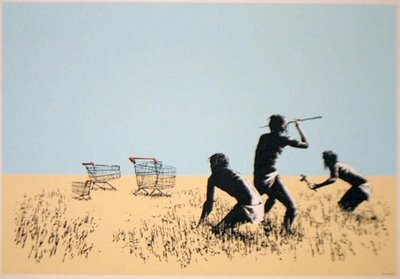 Banksy is a graffiti artist who makes high art out of the political. 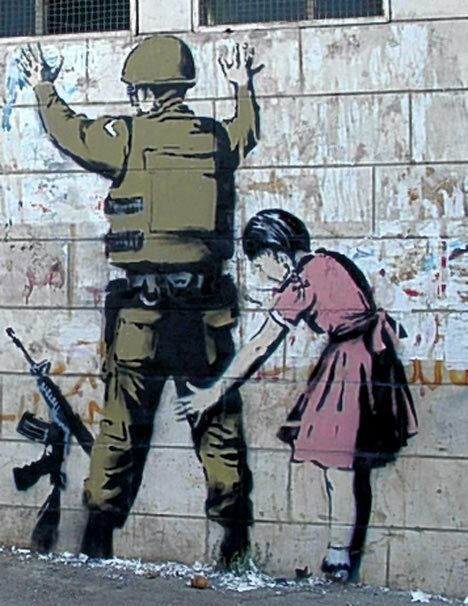 His work can be seen on walls from post-hurricane New Orleans to the military division between Palestine and Israel. 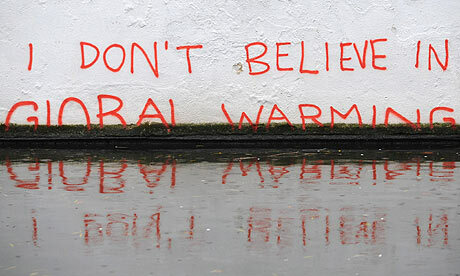 With Banksy, there’s always at least one subversive message to be discovered. Ok – maybe it’s not the kind of thing you’d want hanging on your wall. Or is it? 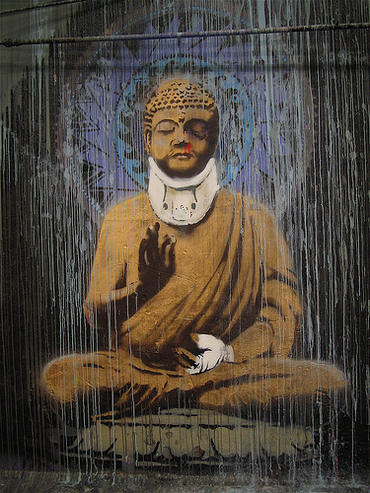 I picked up a canvas with Banksy’s beat up Buddha, complete with black eye, bloodied nose, neck brace and bandaged hand. I wondered what the kids would make of this. So I plunked down 25 pounds and bought it. The first thing I did when I got home was pound a nail into the empty wall behind the toilet in the bathroom and hang it. It’s a prime piece of art real estate for the male gender, who probably spend more time staring at that space than any other, I reasoned. Evan noticed it first. He came running out of the bathroom, “I love it,” he shouted. “Great! Keep going,” I encouraged. A calm mind can handle the worst of human nature. It’s a statement about the Chinese government invading Tibet and killing the monks. It’s a statement about the Burmese government attacking monks. It’s not possible to be perfect. Organized religion can be a giant deception. 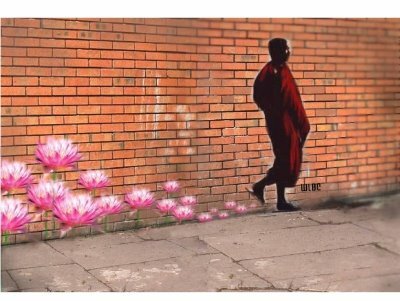 Since the original was spray painted on a wall in London and was already painted over, it shows that everything is an illusion. I’m sure there’s a lot more that can be said (please feel free to add your interpretation), but I learned a lot from our little exercise in art appreciation. Life can be taken sitting down, observing. That can be a good thing. But it can also be grabbed, interpreted, discussed, debated, found wanting, enjoyed. And when we take it to this level, it’s all the richer. Life is art. Awesome bunch of art! 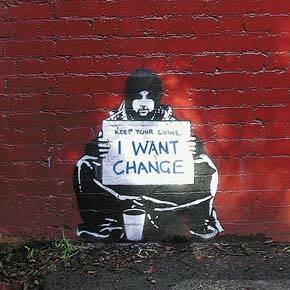 Wish all graffiti was so thought-provoking. Resilient regardless of what comes his way. I also wish to add that I look forward to visiting your bathroom gallery. Catching up on your posts. Love the photos! !